The main character, Rose Edelstein, discovers in her youth that she has the amazing talent of being able to taste the feelings of the chef in the dish that they cook. This talent has drastic consequences as it results in her discovery of the profound sadness of her mother. Rose is unable to eat with pleasure, except on rare occasions as it is difficult to find truly happy chefs. It soon becomes apparent that she is not the only one in the family with a special talent. Her brother dies of his, and her distant father is scared of his undiscovered talent. In the end, Rose discovers that her talent has very practical applications. 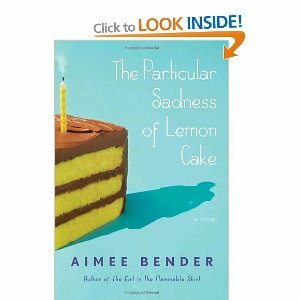 The Particular Sadness of Lemon Cake seamlessly blends fantasy and realistic fiction. The realistic parts of the novel allow the reader to connect to and with the various characters. The fantasy creates interest and a unique story line. The very last chapter segment should have been cut as it muddles the conclusions that were previously drawn. Overall, a very worthwhile read! Eating the Web: Katz and the state of things. Eating the Web: Pizza cutters and cookbooks.